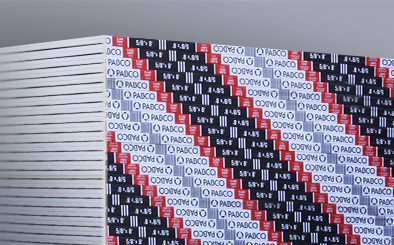 PABCO FLAME CURB® family of gypsum panels are composed of a naturally noncombustible, fire-resistant gypsum core, reinforced with glass fibers that provide increased strength and enhanced fire-resistant properties. The core is wrapped in high quality 100% recycled facing and backing paper that will accept most decorative finishes. FLAME CURB® is intended for fire-rated interior walls and ceilings in residential or commercial construction. FLAME CURB® Type X meets and/or exceeds the requirements of Type X drywall by ASTM C1396. FLAME CURB® 1/2" Super C is appropriate for commercial applications requiring extended fire resistance performance that exceeds the Type X classification. G502, G504, G515, G523, G524, G526, G527, G528, G529, G530, G531, G533, G534, L502, L503, L504, L507, L510, L512, L514, L524, L525, L530, L542, P237, P510, P512, U312, U317, U320, U406, U410, U412, U426, U428, U429, U435, U436, U438, U440, U441, U443, U444, U448, U451, U452, U453, U454, U455, U467, U474, U478, U529, U608, U620, U910, U912, U914, V418, X507, X513, X514, X515, X518, X520, X521, X522, X523, X524, X530, X531. G501, G503, G505, G507, G508, G520, G531, L501, L508, L532, L556, L591, N501, N502, N505, P225, P227, P727, P230, P235, P250, P254, P259, P266, P302, P508, P510, P516, P517, P540, P541, P743, P745, P747, P749, P751, P811, P829, U017, U026, U032, U040, U204, U207, U208, U301, U302, U305, U309, U321, U326, U329, U330, U332, U337, U338, U339, U341, U342, U344, U351, U354, U355, U356, U357, U358, U360, U364, U369, U374, U379, U411, U418, U420, U421, U425, U434, U436, U439, U442, U445, U449, U450, U460, U465, U466, U467, U469, U473, U475, U485, U487, U494, U495, U502, U504, U505, U506, U510, U512, U609, U615, U617, U622, U623, U626, U633, U637, U646, U647, U648, U651, U652, U926, V304, V310, V417, V419, V420, V421, V430, V431, V432, V434, V435, X508, X510, X516, X517, X525, X526, X527, X528, X538, X602. G501, G503, G505, G507, G508, G531, L501, L508, L532, L556, L591, N501, N502, N505, P508, P510, P511, P517, P540, P541, U017, U026, U207, U208, U301, U302, U305, U309, U321, U326, U329, U330, U337, U338, U339, U341, U342, U344, U351, U354, U355, U356, U357, U358, U360, U364, U369, U379, U411, U418, U420, U421, U425, U434, U436, U439, U442, U445, U449, U450, U460, U465, U466, U467, U469, U473, U485, U487, U494, U502, U504, U505, U506, U510, U512, U609, U615, U617, U622, U637, V304, V310, V417, V419, V421, V431, X508, X510, X516, X517, X525, X526, X527, X528. D301, D501, D502, D505, G501, G503, G505, G512, G515, G521, G523, G525, G526, G527, G528, G529, G530, G531, G538, J501, J503, J504, L501, L505, L508, L511, L512, L513, L514, L516, L520, L523, L525, L526, L527, L528, L529, L530, L538, L539, L540, L541, L588, L591, L592, L598, M508, M519, N501, N502, N505, P502, P503, P504, P505, P506, P507, P508, P509, P510, P513, P514, P519, P549, P554, U023, U301, U302, U305, U309, U311, U329, U333, U334, U340, U342, U354, U355, U374, U379, U411, U428, U429, U442, U445, U451, U457, U465, U466, U467, U469, U473, U485, U501, U502, U504, U505, U506, U510, U512, U602, U605, U617, U627, U642, U643, U645, V304, V310, V414, V417, V419, V495, X501, X502, X504, X508, X509, X516, X517.